The Steelpan, the National instrument of Trinidad and Tobago, has been widely accepted as the first musical instrument to be invented in the 20th Century. This accolade continues to be the pride and joy of our nation, and the instrument has since taken its place as an innovative and important contribution to the world of percussion. The steelpan instrument continues to fascinate the world with its unique melodic, tonal and rhythmic qualities, and its sounds reverberate as the musical heartbeat of the cultural landscape of Trinidad and Tobago. The pan is a pitched percussion instrument, toned chromatically (although some toy or novelty steelpans are tuned diatonically), made from steel drums that originally were derived from oil drums. 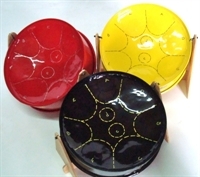 In fact, drum refers to the steel drum containers from which the pans are made; the steeldrum is correctly called a steel pan or pan as it falls into the idiophone family of instruments, and is not technically regarded as a drum. The pan is struck by a pair of straight sticks tipped with rubber, and the type of rubber tip is unique to the class of pan being played. This skill and performance has been conclusively shown to have grown out of Trinidad and Tobago's early 20th century Carnival percussion groups known as Tamboo Bamboo. 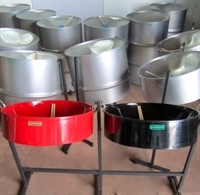 The steelpan evolved out of earlier musical practices of Trinidad and Tobago. Drumming was used as a form of communication among the enslaved Africans and was subsequently outlawed by the British colonial government in 1783. African slaves also performed during Mardi Gras celebrations, joining the French that had brought the tradition to the island that is now Trinidad and Tobago’s Carnival, one of the grandest cultural street festivals in the world. The two most important influences were the drumming traditions of both Africa and India. The instrument's invention was therefore a specific cultural response to the conditions present on the islands of Trinidad and Tobago. The first instruments developed in the evolution of steelpan were Tamboo-Bamboos, tunable sticks made of bamboo wood. These were hit onto the ground and with other sticks in order to produce sound. Tamboo-Bamboo bands also included percussion of a (gin) bottle and spoon. By the mid-1930s, bits of metal percussion were being used in the tamboo-bamboo bands, the first probably being either the automobile brake hub "iron" or the biscuit drum "boom". The former replaced the gin bottle-and-spoon, and the latter the "bass" bamboo that was pounded on the ground. By the late 1930s their occasional all-steel bands were seen at Carnival and by 1940 it had become the preferred Carnival accompaniment of young underprivileged men. The 55-gallon oil drum was used to make lead steelpans from around 1947, however the highest-quality versions are today sourced from specific sheet metal drums. 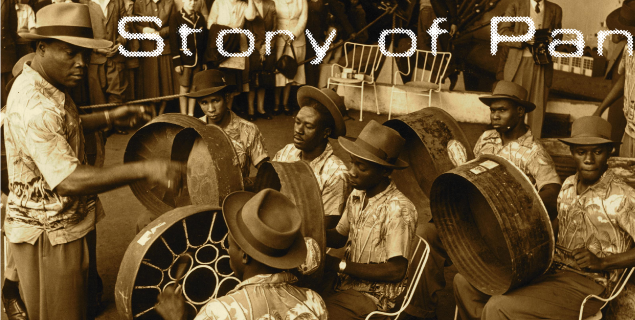 The Trinidad All Steel Percussion Orchestra (TASPO), formed to attend the Festival of Britain in 1951, was the first steelband whose instruments were all made from oil drums, and the first group of artists to perform the instrument outside the Caribbean. Since then, the popularity of the instrument has grown rapidly, and its use has penetraed the realms of the live music performance, concert percussion, percussion arts education, special music education, health & wellness, and recording.